I first found this novel during a book hunt back in 2006, at that time I hadn't heard of the author however I had just read Kim Stanley Robinson's Red Mars and as such was looking for another space opera "settlement" style novel. What I found with Coyote impressed me so much that I went straight out and got the next 2 novels in the series right after finishing the first. 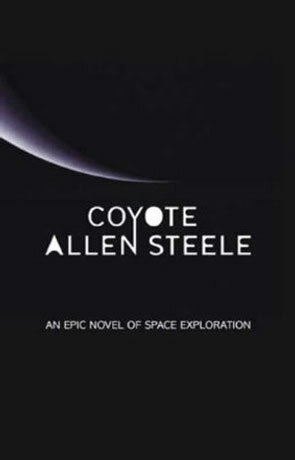 While Robinson's classic is limited to our solar system, this is the story of Earth's very first interstellar venture as colonists journey to a mysterious moon known as Coyote - destined to be their new home. Coyote is a moon which orbits the planet Bear (known in reality as known as 47 Ursae Majoris b, a gas giant) within the 47 Ursae Majoris system, 46 light years from earth. This auspicious event isn't the only record breaker though, it begins with the crime of the century as the starship Alabama is hijacked by captain R.E. Lee and crew, replacing hand picked passengers with political dissidents and their families to escape the tyrannical United Republic. At a cruise velocity of .2c it is a journey that will take the intrepid explorers 230 years - most of which will be spent in biostatis. One of the most striking things about this novel is the way that it's structured, rather than concentrate on one or two major protagonists it's the very idea of colonisation that is the focus of the story, told through a number of different characters. This format is due to the novel being originally published as a series of short stories (known as a "fix up" novel) and it works much better than I thought it would. At no point does it feel in any way disjointed, instead the story gains power and stays fresh, seen from these different perspectives. There is a complex social structure to the group of frontier people, not only do we have those seeking to escape the draconian government that has replaced a large part of the fallen USA - the United Republic of America (URA), an authoritarian conservative regime - but also a number of loyalists, military types and plain bad people, with a wide age group from kids to middle aged adults. The second part of the story deals with that of isolation, sanity and how someone could possibly cope with a lifetime alone, even though it only takes up a small part of the story it's none-the-less a powerful message and is played out very well, with interesting repercussions later on. Once we actually get to the habitable moon the story becomes an excellent, detailed and well considered study into how a small group could survive on a remote moon 46 light years from Earth. This includes a rich interplay with the different personalities and political ideologies and is played out from a number of different perspectives which breaks up the story very effectively. As a story of colonisation, not only does it come across as highly believable, it's much more fluid and a damn site more energetic than Red Mars, Kim Stanley Robinson could really learn something from Steele. The science used is also described clearly and without descending into overly descriptive hard sci-fi which keeps the pace fairly swift and allows the attention to be given over to the actual story and characters of the novel. In places it's quite emotional and grips you completely, in others the events that this hostile environment throw at the colonists is planned out fantastically but it's the ending that is the star of the show and really does leave you wanting more, a powerful tale of future colonisation. There seems to be a lot of quite polar views about this book, some people rave about it while others slam it completely, with very little middle ground. I for one love it - the story has a great deal of energy and comes across as very believable without becoming mired in overly technical descriptions. One of the finest examples of extra solar colonisation I have ever read. Written on 30th December 2011 by Ant.